I tattooed their names on them so everyone would know which one is which. 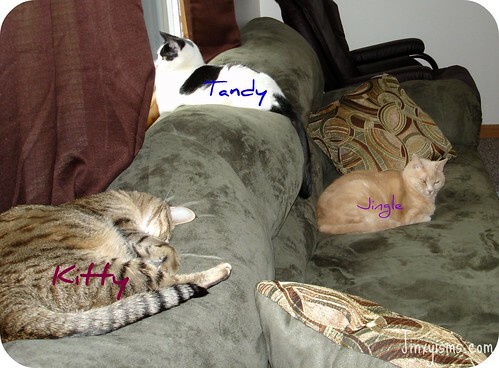 Those seem to be Jingle and Kitty’s permanent spots on the couch. I haven’t seen Tandy on the couch since then. This entry was posted in Fun, Wordless Wednesday and tagged Wordless Wednesday. I think our puppy has her favorite spot on the couch too!! Great picture! I had a dog who use to sit on the back of the couch and look out the window. Love the video of Lily! It is so fun when they start to make noises. I have a 6 1/2 month old and he just squeals now! Check out my Wordless Wednesday here. wow lots of cats… I could never come over. I’m very allergic! Ah, to be a cat. Cats always look like they have it made! I can’t have kitties anymore because my son is allergic, but seeing pictures like this makes me miss them! I want to come back as one of your cats, sans tattoo. LOL Here for WW. Isn’t it funny how they tend to find one place and stay there forever!!! Then in about a year there is a new spot! Tandy looks like he loves people watching! Don’t you love how our pets take over our homes? I salute anyone who can take care of kittens—because I can’t.